The sarcophagus in its current location. The sarcophagus of Eshmunazar II (Phoenician: ʾšmnʿzr), a Phoenician king of Sidon and the son of King Tabnit (possibly the Greek Tenes), was created in the early 5th century BCE. It was unearthed in 1855 at a site near Sidon and is now in the Louvre. 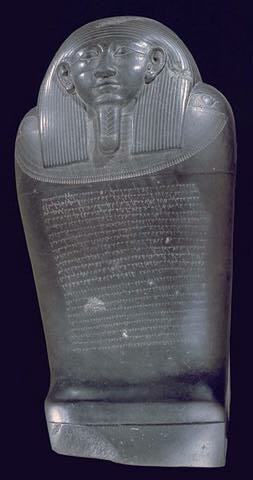 The sarcophagus was likely created in Egypt, being carved from amphibolite from Wadi Hammamat. The inscription states that the "Lord of Kings" granted the Sidonian kings territory in Palestine: Dor, Jaffa, the Plain of Sharon. The inscription is the first discovered in the Phoenician language from the area known as Phoenicia. The sarcophagus was discovered in the Necropolis of Magharat Abloun ("Cavern of Apollo") on 20 February 1855 by Aimé Péretié, chancellor of the French consulate of Beirut. It was purchased in the same year by Honoré Théodoric d'Albert de Luynes, who donated it to the Louvre. The sarcophagus bears a 22 line inscription, known as KAI-14, written in the Phoenician Canaanite language, in the Phoenician alphabet. The inscription identifies the king inside and warns people not to disturb his repose. The language used in the inscription is a Canaanite dialect mutually intelligible with Biblical Hebrew. As in other Phoenician inscriptions, the text seems to use no, or hardly any, matres lectionis. As in Aramaic, the preposition אית (ʾyt) is used as an accusative marker, while את (ʾt) is used for "with". The translation below is based on that by Julius Oppert, amended with the help of a more recent translation in Prichard & Fleming. the sacred gods shall abandon them and exterminate this royal race and this ordinary man and their offspring for ever. The text of the 22 line inscription, on the front side of the sarcophagus, follows, with one-to one transliteration into the Hebrew alphabet. The original text contains no word breaks; these are merely suggested; numbers appear in the original inscription in an Egyptian standard. ^ Louvre website: "The favor of the Persian king had increased the territory of Sidon by granting it part of Palestine: "The Lord of Kings gave us Dor and Yapho, the rich wheat-lands that are in the Plain of Sharon, in recognition of the great deeds that I accomplished and we have added to the lands that are forever those of the Sidonians."" ^ Lehmann, Reinhard G. (2013). "Wilhelm Gesenius and the Rise of Phoenician Philology" (PDF). Beihefte zur Zeitschrift für die alttestamentliche Wissenschaft. Berlin / Boston: De Gruyter. 427: 209–266. Quote: "Alas, all these were either late or Punic, and came from Cyprus, from the ruins of Kition, from Malta, Sardinia, Athens, and Carthage, but not yet from the Phoenician homeland. The first Phoenician text as such was found as late as 1855, the Eshmunazor sarcophagus inscription from Sidon." ^ a b Samuel Birch, Records of the past: Being English Translations of the Ancient Monuments of Egypt and Western Asia, vol. 9, 1877, p. 111. ^ a b "Kanaanäische und Aramäische Inschriften", Herbert Donner, Wolfgang Röllig , ISBN 3-447-04587-6. ^ Cline, Austin. "Sidon Sarcophagus: Illustration of the Sarcophagus of Eshmunazar II Found Near Sidon, Lebanon". About.com. Retrieved 2009-03-27. ^ James B. Prichard and Daniel E. Fleming, The Ancient Near East: An Anthology of Texts and Pictures, 2011, p. 311. ^ The eighth month of the Phoenician year which was identical with the Judaic. ^ King Eshmunazar lived in the fourth century B.C., this is generally admitted on account of the form of the sarcophagus, which was certainly Egyptian; there are even in the middle of it traces of hieroglyphs which have been erased. The King Tabnit may be the Tennes of Greek authors. ^ The "Lords of the Kings" seem not to be the Kings of Persia, but an epithet applicable to a divine king. GIF image of the inscription. Information on the Eshmunazar inscription (in Spanish). A photograph of the sarcophagus. Cyrus II of Persia, commonly known as Cyrus the Great and called Cyrus the Elder by the Greeks, was the founder of the Achaemenid Empire. From the Mediterranean Sea and Hellespont in the west to the Indus River in the east, under his successors, the empire eventually stretched at its maximum extent from parts of the Balkans and Eastern Europe proper in the west, to the Indus Valley in the east. His regal titles in full were The Great King, King of Persia, King of Anshan, King of Media, King of Babylon, King of Sumer and Akkad, the reign of Cyrus the Great lasted between 29 and 31 years. Cyrus built his empire by conquering first the Median Empire, the Lydian Empire, either before or after Babylon, he led an expedition into central Asia, which resulted in major campaigns that were described as having brought into subjection every nation without exception. Cyrus did not venture into Egypt, as he died in battle. He was succeeded by his son, Cambyses II, who managed to add to the empire by conquering Egypt, Cyrus the Great respected the customs and religions of the lands he conquered. This became a successful model for centralized administration and establishing a government working to the advantage. In fact, the administration of the empire through satraps and the principle of forming a government at Pasargadae were the works of Cyrus. Cyrus the Great is recognized for his achievements in human rights, politics. Having originated from Persis, roughly corresponding to the modern Iranian province of Fars and this view has been criticized by some historians as a misunderstanding of the Cylinders generic nature as a traditional statement that new monarchs make at the beginning of their reign. The name Cyrus is a Latinized form derived from the Greek Κῦρος, Kỹros, the name and its meaning has been recorded in ancient inscriptions in different languages. This may point to a relationship to the mythological first king of Persia, Jamshid. 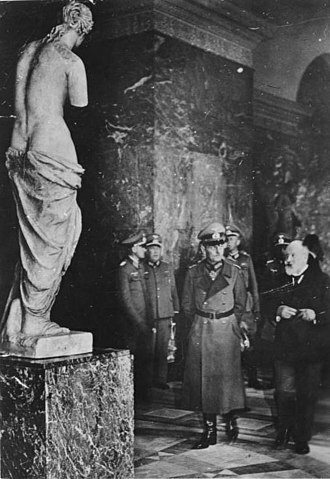 Karl Hoffmann has suggested a translation based on the meaning of an Indo-European-root to humiliate, in the Persian language and especially in Iran, Cyruss name is spelled as کوروش. The Louvre or the Louvre Museum is the worlds largest museum and a historic monument in Paris, France. A central landmark of the city, it is located on the Right Bank of the Seine in the citys 1st arrondissement, approximately 38,000 objects from prehistory to the 21st century are exhibited over an area of 72,735 square metres. The Louvre is the second most visited museum after the Palace Museum in China. The museum is housed in the Louvre Palace, originally built as a fortress in the late 12th century under Philip II, remnants of the fortress are visible in the basement of the museum. 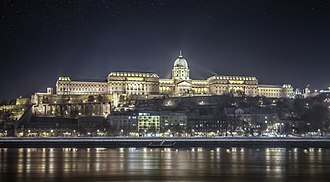 Due to the expansion of the city, the fortress eventually lost its defensive function and. The building was extended many times to form the present Louvre Palace, in 1692, the building was occupied by the Académie des Inscriptions et Belles Lettres and the Académie Royale de Peinture et de Sculpture, which in 1699 held the first of a series of salons. The Académie remained at the Louvre for 100 years, during the French Revolution, the National Assembly decreed that the Louvre should be used as a museum to display the nations masterpieces. The museum opened on 10 August 1793 with an exhibition of 537 paintings, because of structural problems with the building, the museum was closed in 1796 until 1801. The collection was increased under Napoleon and the museum renamed Musée Napoléon, the collection was further increased during the reigns of Louis XVIII and Charles X, and during the Second French Empire the museum gained 20,000 pieces. Holdings have grown steadily through donations and bequests since the Third Republic, whether this was the first building on that spot is not known, it is possible that Philip modified an existing tower. According to the authoritative Grand Larousse encyclopédique, the name derives from an association with wolf hunting den, in the 7th century, St. Fare, an abbess in Meaux, left part of her Villa called Luvra situated in the region of Paris to a monastery. This territory probably did not correspond exactly to the modern site, the Louvre Palace was altered frequently throughout the Middle Ages. In the 14th century, Charles V converted the building into a residence and in 1546, Francis acquired what would become the nucleus of the Louvres holdings, his acquisitions including Leonardo da Vincis Mona Lisa. Amphibolite is a metamorphic rock that contains amphibole, especially the species hornblende and actinolite, as well as plagioclase. A holocrystalline plutonic igneous rock composed primarily of hornblende amphibole is called a hornblendite, rocks with >90% amphiboles which have a feldspar groundmass may be a lamprophyre. Amphibolite is a grouping of rocks composed mainly of amphibole and plagioclase feldspars and it is typically dark-colored and heavy, with a weakly foliated or schistose structure. The small flakes of black and white in the rock often give it a salt-and-pepper appearance, amphibolites need not be derived from metamorphosed mafic rocks. Because metamorphism creates minerals based entirely upon the chemistry of the protolith, certain dirty marls, deposits containing dolomite and siderite readily yield amphibolites especially where there has been a certain amount of contact metamorphism by adjacent granitic masses. Metamorphosed basalts create ortho-amphibolites and other chemically appropriate lithologies create para-amphibolites, while it is a metamorphic amphibole, is derived most usually from highly metamorphosed ultramafic rocks, and thus tremolite-talc schists are not generally considered as amphibolites. If the amphibolite appears to transgress apparent protolith bedding surfaces it is an ortho-amphibolite, picking a sill and thin metamorphosed lava flows may be more troublesome. Thereafter, whole rock geochemistry will suitably identify ortho- from para-amphibolites, the word metabasalt was thus coined, largely to avoid the confusion between ortho-amphibolites and para-amphibolites. While not a metamorphic rock name, as it infers an origin. Amphibolites define a set of temperature and pressure conditions known as the amphibolite facies. However, caution must be applied here before embarking on metamorphic mapping based on amphibolites alone. Firstly, for an amphibolite to be classed as a metamorphic amphibolite, it must be certain that the amphibole in the rock is a prograde metamorphic product, for instance, actinolite amphibole is a common product of retrograde metamorphism of basalts at greenschist facies conditions. Actinolite schists are often the result of alteration or metasomatism. Secondly, the microstructure and crystal size of the rock must be appropriate, amphibolite facies conditions are experienced at temperatures in excess of 500 °C and pressures less than 1.2 GPa, well within the ductile deformation field. Cambyses I or Cambyses the Elder was king of Anshan from c.580 to 559 BC and the father of Cyrus the Great, younger son of Cyrus I, and brother of Arukku. He should not be confused with his better-known grandson Cambyses II, Cambyses was an early member of the Achaemenid dynasty. 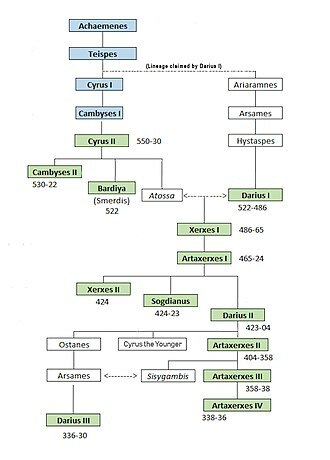 He was apparently a great-grandson of its founder Achaemenes, grandson of Teispes and his paternal uncle was Ariaramnes and his first cousin was Arsames. According to Herodotus, Cambyses was a man of good family and he reigned under the overlordship of Astyages, King of Media. He was reportedly married to Princess Mandane of Media, a daughter to Astyages and his wife was reportedly a granddaughter to both Cyaxares of Media and Alyattes II of Lydia. 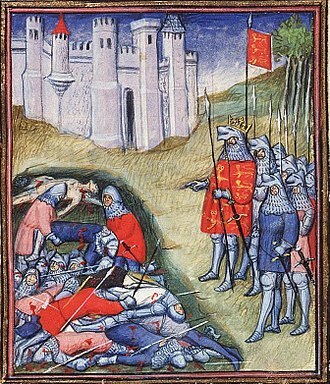 The result of their marriage was the birth of his successor Cyrus the Great, according to Nicolas of Damascus his original name was Atradates, and he was wounded and died in the Battle of the Persian Border which he, with his son, fought against Astyages. 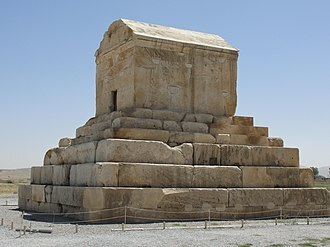 It occurred in about 551 BC, and he is reported to have received an honorable burial and this was not the case with Cyrus the Great who would go on to depose his grandfather, and begin the Persian Empire. The usurper is named Gaumata in the Behistun inscription of Darius I, named Smerdis in Herodotus Histories, and is named Sphendadates in the surviving fragments of Ctesias. In Darius trilingual Behistun inscription, the prince being impersonated is named Pirtiya in Elamite, Bardiya in Old Persian, in the Histories, the prince and his imposter have the same name. For Ctesias, Sphendadates poses as Tanyoxarces, other Greek sources have various other names for the figure being impersonated, including Tanoxares and Mardos. The three oldest surviving sources agree that Gaumata/Pseudo-Smerdis/Sphendadates is overthrown by Darius and others in a coup détat, most sources have Darius as part of a group of seven conspirators. In Greek and Latin sources, Darius subsequently gains kingship by cheating in a contest, the evaluation of the primary sources has been cause for much disagreement in modern scholarship. The key argument against a fabrication is that there is no evidence for it, the key argument for a fabrication is that Darius had reason to invent the story since he had no particular rights to the throne. Cambyses had Bardiya killed, and succeeded in keeping that a secret from the people, while Cambyses was away in Egypt, rebellions developed in Persia and in Media and in other provinces. A maguish by the name of Gaumata began to proclaim himself as Bardiya, still in Egypt, committed suicide. Out of fear of retribution from Gaumata, the people remained quiet, a section of the Behistun inscription of a date has another rebel, a certain Vahyazdata, claiming to be Bardiya. A longer version of the story appears in Book 3 of Herodotus Histories, jealous of his brother Smerdis skill with a particular bow brought from the king of Ethiopia, Cambyses sends Smerdis back to Persis. Cambyses has a dream in which Smerdis would supplant him, the assassination succeeds and is meant to be kept secret. One of the few that know of Smerdis death is Patizeithes and that steward has a brother who greatly resembles Smerdis in appearance, and whose name is Smerdis. The steward puts his brother on the throne, and has him pretend that he is the brother of Cambyses, the false Smerdis succeeds in the deception by not allowing anyone who knew the real Smerdis into his presence. Dagon or Dagan is an ancient Mesopotamian Assyro-Babylonian and Levantine deity. He appears to have been worshipped as a fertility god in Ebla, Ugarit, the Hebrew Bible mentions him as the national god of the Philistines with temples at Ashdod and elsewhere in Gaza. 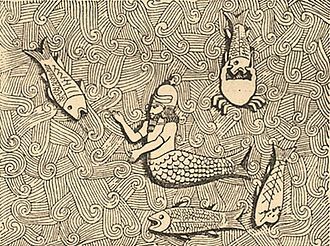 A long-standing association with the word for fish dâg, perhaps going back to the Iron Age, has led to an interpretation as a fish-god, and the association of merman motifs in Assyrian art. The gods name was, more derived from a word for grain, suggesting that he was in origin associated with fertility. The name is recorded as Ugaritic Dgn, Dagana, in Ugaritic, the root dgn means grain, in Hebrew דגן dāgān, Samaritan dīgan, is an archaic word for grain. The Phoenician author Sanchuniathon explained Dagon as a word for grain, Sanchuniathon further explains, And Dagon, after he discovered grain and the plough, was called Zeus Arotrios. The word arotrios means ploughman, pertaining to agriculture, the theory relating the name to Hebrew dāg/dâg, based solely upon a reading of 1 Samuel 5, 2–7 is discussed in Fish-god tradition below. The god Dagon first appears in extant records about 2500 BC in the Mari texts and in personal Amorite names in which the Mesopotamian gods Ilu and Adad are especially common. At Ebla, from at least 2300 BC, Dagan was the head of the city pantheon comprising some 200 deities and bore the titles BE-DINGIR-DINGIR, Lord of the gods and Bekalam and his consort was known only as Belatu, Lady. Both were worshipped in a temple complex called E-Mul, House of the Star. One entire quarter of Ebla and one of its gates were named after Dagan, Dagan is called ti-lu ma-tim, dew of the land and Be-ka-na-na, possibly Lord of Canaan. He was called lord of many cities, of Tuttul, Irim, Ma-Ne, Uguash, Dagan is mentioned occasionally in early Sumerian texts but becomes prominent only in Assyro-Babylonian inscriptions as a powerful and warlike protector, sometimes equated with Enlil. Dagans wife was in some sources the goddess Shala, in other texts, his wife is Ishara. In the preface to his famous law code, King Hammurabi calls himself the subduer of the settlements along the Euphrates with the help of Dagan, his creator. Cambyses II son of Cyrus the Great, was emperor of the Achaemenid Empire. Cambyses grandfather was Cambyses I, king of Anshan, after the Egyptian campaign and the truce with Libya, Cambyses invaded the Kingdom of Kush but with little success. Though numerous scholars link Cambyses to the Sanskrit tribal name Kamboja there are few scholars who suggest Elamite origin of the name, jean Przyluski had sought to find an Austric affinity for Kamboja. Friedrich von Spiegel, Sten Konow, Ernst Herzfeld, James Hope Moulton, Wojciech Skalmowski, James Hope Moulton regards Spiegels suggestions as the best of other etymological explanations of these two names. On the other hand, Arnold J, when Cyrus the Great conquered Babylon in 539 BC, Cambyses was employed in leading religious ceremonies. In the cylinder which contains Cyrus proclamation to the Babylonians, Cambyses name is joined to his fathers in the prayers to Marduk, on a tablet dated from the first year of Cyrus, Cambyses is called king of Babylon, although his authority seems to have been ephemeral. Only in 530 BC, when Cyrus set out on his last expedition into the East, numerous Babylonian tablets of the time date from the accession and the first year of Cambyses, when Cyrus was king of the countries. After the death of his father in 530 BC, Cambyses became sole king, the tablets dating from his reign in Babylonia run to the end of his eighth year, in 522 BC. Herodotus, who dates his reign from the death of Cyrus, gives his reign a length of seven years five months, the traditions about Cambyses, preserved by the Greek authors, come from two different sources. The first, which forms the part of the account of Herodotus, is of Egyptian origin. Here Cambyses is made the son of Cyrus and a daughter of Apries named Nitetis. 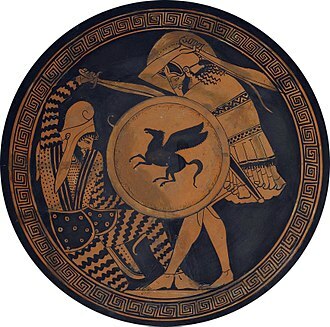 Intermingled are some stories derived from the Greek mercenaries, especially about their leader Phanes of Halicarnassus, who betrayed Egypt to the Persians. In the Persian tradition the crime of Cambyses is the murder of his brother, he is accused of drunkenness, in which he commits many crimes. Samuel Birch was a British Egyptologist and antiquary. Birch was the son of a rector at St Mary Woolnoth and he was educated at Merchant Taylors School. 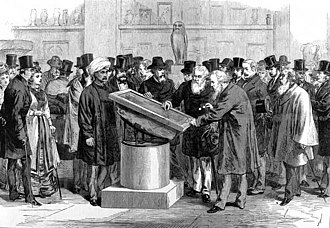 From an early age, his manifest tendency to the study of out-of-the-way subjects well suited his interest in archaeology, after brief employment in the Record Office, he obtained, in 1836, an appointment to the antiquities department of the British Museum. The appointment was due to his knowledge of Chinese, which was unusual at that time and he soon broadened his research to Egyptian. When the cumbrous department came to be divided, he was appointed to head the Egyptian and Assyrian branch. In the latter language he had assistance, but for years there was only one other person in the institution, in a different department. The entire arrangement of the department devolved upon Birch and he further wrote what was long a standard history of pottery, investigated the Cypriote syllabary, and proved by various publications that he had not lost his old interest in Chinese. Xerxes I, called Xerxes the Great, was the fourth king of kings of the Achaemenid dynasty of Persia. 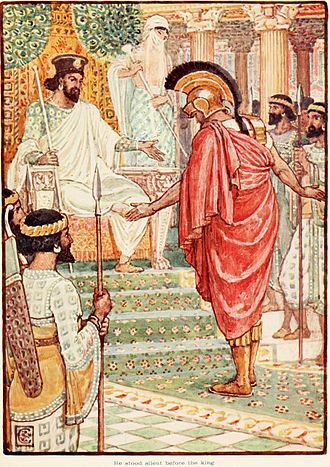 He ruled from 486 BC until his assassination in 465 BC at the hands of Artabanus, Xerxes I is most likely the Persian king identified as Ahasuerus in the biblical Book of Esther. He is notable in Western history for his invasion of Greece in 480 BC. Like his predecessor Darius I, he ruled the empire at its territorial apex and his forces temporarily overran mainland Greece north of the Isthmus of Corinth until the losses at Salamis and Plataea a year reversed these gains and ended the second invasion decisively. Xerxes was born to Darius I and Atossa and Atossa were both Achaemenids as they were both descendants of Achaemenes. While Darius was preparing for war against Greece, a revolt spurred in Egypt in 486 BC due to heavy taxes. Under Persian law, the king was required to choose a successor before setting out on dangerous expeditions, when Darius decided to leave, Darius prepared his tomb at Naqsh-e Rustam and appointed Xerxes, his eldest son by Atossa, as his successor. However, Darius could not lead the campaign due to his failing health, Xerxes was crowned and succeeded his father in October–December 486 BC when he was about 36 years old. Almost immediately, Xerxes crushed revolts in Egypt and Babylon that had broken out the year before, and appointed his brother Achaemenes as satrap over Egypt. In 484 BC, he outraged the Babylonians by violently confiscating and melting down the statue of Bel. This comes from the Daiva Inscriptions of Xerxes, lines 6-13, although Herodotus report in the Histories has created debate concerning Xerxess religious beliefs, modern scholars consider him a Zoroastrian. 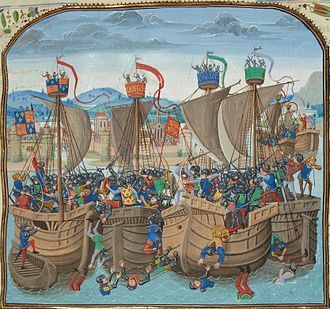 According to the Greek historian Herodotus, Xerxess first attempt to bridge the Hellespont ended in failure when a storm destroyed the flax, in retaliation, Xerxes ordered the Hellespont whipped three hundred times, and had fetters thrown into the water. Xerxess second attempt to bridge the Hellespont was successful, many smaller Greek states, took the side of the Persians, especially Thessaly and Argos. Cyrus I or Cyrus I of Anshan or Cyrus I of Persia, was King of Anshan in Persia from c. 600 to 580 BC or, according to others, from c. 652 to 600 BC. He should not be confused with his famous grandson Cyrus the Great and his name in Modern Persian is کوروش, while in Greek he was called Κῦρος, Kȳros. Cyrus was an member of the Achaemenid dynasty. He was apparently a grandson of its founder Achaemenes and son of Teispes, Teispes sons reportedly divided the kingdom among them after his death. Cyrus reigned as king of Anshan while his brother Ariaramnes was king of Parsa, the chronological placement of this event is uncertain. This is due to his suggested, but still debated identification, Kuras is first mentioned c. 652 BC. In that year Shamash-shum-ukin, king of Babylon, revolted against his brother and overlord Ashurbanipal. Cyrus is mentioned being in an alliance with the former. The war between the two ended in 648 BC with the defeat and reported suicide of Shamash-shum-ukin. Cyrus is mentioned again in 639 BC, at that year Ashurbanipal managed to defeat Elam and became overlord to several of its former allies. His elder son Arukku was reportedly sent to Assyria to pay tribute to its King, Kuras seems to vanish from the historical record. His suggested identification with Cyrus would help connect the Achaemenid dynasty to the events of the 7th century BC. Cyrus presumably continued paying tribute to his sons and successors Ashur-etil-ilani and they were both opposed by an alliance led by Cyaxares of Media and Nabopolassar of Babylon. In 612 BC the two managed to capture the Assyrian capital Nineveh and this was effectively the end of the Neo-Assyrian Empire though remnants of the Assyrian Army under Ashur-uballit II continued to resist from Harran. Media and Babylon soon shared the lands controlled by the Assyrians. Anshan apparently fell under the control of the former, Cyrus is considered to have ended his days under the overlordship of either Cyaxares or his son Astyages. Cyrus was succeeded by his son Cambyses I and his grandson would come to be known as Cyrus the Great, founder of the Persian Empire. Layos Sarcophagus, Museu Frederic Marès. Cover of a Phoenician anthropoid sarcophagus of a woman, made of marble, 350–325 BC, from Sidon, now in the Louvre. 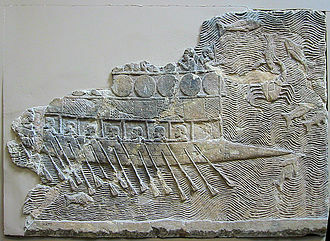 Assyrian warship (probably built by Phoenicians) with two rows of oars, relief from Nineveh, c. 700 BC. Phoenician sarcophagi found in Cádiz, now in the Archaeological Museum of Cádiz; the sarcophagi are thought to have been imported from the Phoenician homeland around Sidon. Alleyway inside the Old Souks. Spring flowers bloom near the base of a Babylonian-style column in Bustan el-Sheikh. The lower clock on the Jewish Town Hall building in Prague, with Hebrew numerals in counterclockwise order. Cyrus the Great is said in the Bible to have liberated the Hebrew captives in Babylon to resettle and rebuild Jerusalem, earning him an honored place in Judaism. 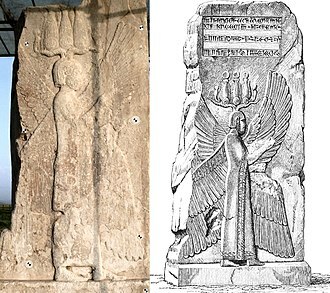 Cyrus the Great with a Hemhem crown, or four-winged Cherub tutelary divinity, from a relief in the residence of Cyrus in Pasagardae. The four-winged guardian figure representing Cyrus the Great or possibly a four-winged Cherub tutelary deity. Bas-relief found at Pasargadae on top of which was once inscribed in three languages the sentence "I am Cyrus the king, an Achaemenian." "I am Cyrus the king, an Achaemenid" in Old Persian, Elamite and Akkadian languages. It is known as the "CMa inscription", carved in a column of Palace P in Pasargadae. These inscriptions on behalf of Cyrus were probably made later by Darius I in order to affirm his lineage, using the Old Persian script he had designed. A similar image at the Metropolitan Museum of Art. Portrait of the Achaemenid ruler toppled by Darius, as appearing on the Behistun inscription. He ruled for several months over the Achaemenid Empire. It remains unknown whether he was the legitimate Smerdis/ Bardiya, son of Cyrus the Great, falsely claimed by Darius to be an imposter, or indeed a real imposter called Gaumata. Gaumata under Darius I's boot engraved at Behistun Inscription in Kermanshah. Gaumata being trampled upon by Darius the Great, Behistun inscription. The Old Persian inscription reads "This is Gaumâta, the Magian. He lied, saying "I am Smerdis, the son of Cyrus, I am king"." Phaedyme is sent by her father Otanes, to check if King Smerdis has ears under his turban, as the suspected imposter was known to have had them cut off in punishment for a crime. She found that indeed the king did not have ears anymore, which proved that he was an imposter, and justified the coup in favour of Darius I. Probable depiction of Xerxes I as crown-prince, in the Audience scene of Darius, Persepolis. The soldiers of Xerxes I, of all ethnicities, on the tomb of Xerxes I, at Naqsh-e Rostam. Achaemenid king killing a Greek hoplite. Impression from a cylinder seal, sculpted circa 500 BC–475 BC, at the time of Xerxes I. Metropolitan Museum of Art. The ancient Egyptian god Amun-Min in front of Artaxerxes' cartouche. Ethnicities of the Empire on the tomb of Artaxerxes I at Naqsh-e Rostam. Relief of Artaxerxes II on his tomb at Persepolis, Iran. 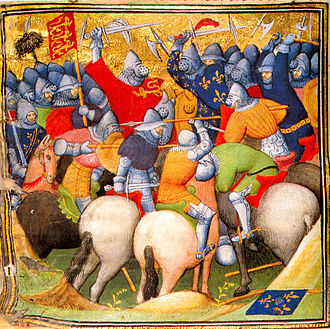 Retreat of the Ten Thousand, at the Battle of Cunaxa. Jean Adrien Guignet. Armoured cavalry of Achaemenid Hellespontine Phrygia attacking a Greek psiloi at the time of Artaxerxes II and his Satrap Pharnabazus II, Altıkulaç Sarcophagus, early 4th century BCE. The Satraps of Asia Minor Artabazus (left) and Orontes (right) revolted against the new king Artaxerxes III in 354-353 BC. Achaemenid coinage of Idrieus of Caria during the reign of Artaxerxes III, showing the Achaemenid king on the obverse, and his satrap Idrieus on the reverse. Circa 350-341 BC. Tomb of Artaxerxes III at Persepolis. Soldiers of various ethnicities of the Achaemenid Empire, tomb of Atarxerxes III. Garnet amphibolite, sold as "Nordic Sunset Granite", reportedly from Murmansk area. Prospective tomb of Darius II of Persia in Naqsh-e Rustam. Soldiers of the Empire, on the tomb of Darius II. Darius II as depicted on his tomb. Gold foundation tablets of Darius I for the Apadana Palace, in their original stone box. The Apadana coin hoard had been deposited underneath. Circa 510 BC. One of the two gold deposition plates. Two more were in silver. They all had the same trilingual inscription (DPh inscription). Position of Achaemenes in the Achaemenid lineage. Position of Ariaramnes in the Achaemenid lineage according to Darius the Great in the Behistun inscription.